Bird•B•Gone Withstands the Test of Time! Way back in 1995 the Bank of America branch in Mission Viejo California had a bad pigeon problem. The birds, a flock of about 20 pigeons, were nesting under the eaves and roosting all over the outside of the building. Customer complaints and maintenance costs necessitated that bird control products be used. By coincidence the owner of Bird-B-Gone, Inc., Bruce Donoho used this branch for his personal banking and suggested using his new plastic bird spike system. “We manufactued the spike in the same color as the trim of the building…we even called it ‘Bank of America brown’”, says Donoho. Over 1,000 feet of the product was installed in early 1996. The bank has been bird free ever since! The pigeons moved on to a more suitable habitat, which is not the Bank of America building. The original spike used by Bank of America carried a 5-year guarantee; it is still standing strong today, 12 years later! The spike is still unbreakable even after 12 years in the sun and rain. The demonstration shows that it is still difficult to bend and break. Due to roofing maintenance they are just now replacing some of the spike with the latest in plastic spike from Bird-B-Gone, Inc.,the Bird Spike 2000. The plastic bird spike is an effective humane bird control devise that keeps large pest birds like pigeons and seagulls from landing on buildings, ledges, lights, railings, parapets or any other surface birds frequent. Most products available at the time that the Bank of America needed bird control where expensive metal spikes that where hard to install. They found Bird-B-Gone, Inc. right in their own neighborhood, with an inexpensive, easy to install long lasting new plastic spike! Since the installation at the Bank of America over 12 years ago, the plastic spike has evolved quite a bit. 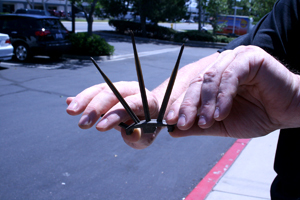 It is still a very durable, rigid spike that is even easier to install. It now comes in a one-piece two-foot section that lies down easily with screws or adhesive. The cost of the plastic spike is still the lowest in the industry making it the most effective, affordable bird spike available. It carries a 5-year guarantee, but is proven to last much longer than that! 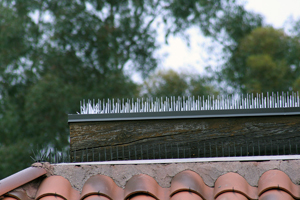 For more information on Bird-B-Gone, Inc’s plastic bird spikes and other products please visit www.birdbgone.com or call 1-800-392-6915.